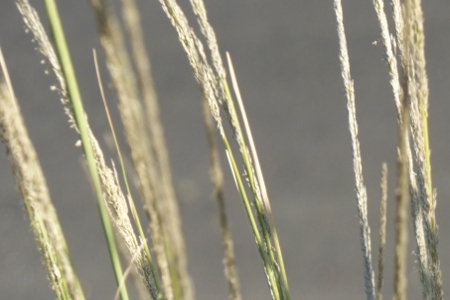 above left: seedheads are a common sight in the Fall. Resist the temptation to immediately chop them down and instead enjoy their quiet beauty. Birds will enjoy their bounty. 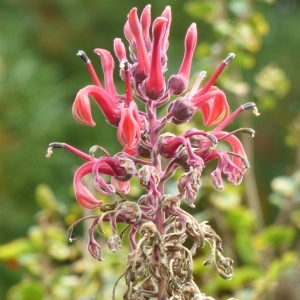 Featured here, Salvia clevelandii, October 2015, Napa. right: asters, guara and crepe myrtle tint a raised bed, October 2015, Napa. below: a close-up of a 'warm' tub at the Green Festival, November 2015.
bottom: with many blooms now gone, this bed, highlighted by a late afternoon sun, calls the eye to focus on texture instead of color, October 2015, Napa. putting the green in Green Festival, here I am being interviewed for New Tang Dynasty TV. Last weekend I hosted my first booth at a convention, San Francisco's Green Festival. I figured it would be a great place to meet with potential customers who shared my appreciation of all things natural. Indeed, many people remarked "wow, something green at the Green Festival! ", and praised the display. And I now appreciate the amount of work that goes into putting together the fantastic installations at the various garden shows. I ended up making drastic changes to my original design when it occured to me one morning, half awake, that there would be lots of children at this event. I'm glad I did, as raising the display off the ground brought the plants closer to eye level and more inviting. I arranged plants, still in their pots, in groupings as I would in the ground, except much closer together, in metal tubs used for watering livestock. The idea was to convey the essence of my design rather than an actual garden. To lure people over, I planted the outside tubs with bright warm tones, featuring reds and yellows, while the background held cool silver and purple tones. Bright white sparkled in both color themes and linked them together. To read more about this display, visit Green Festival, under the projects page. the last blooms of Helianthus angustifolius meet the first blooms of orange calendula, among seedheads of salvias, verbenas, and yarrows. photo by Jeff Herwatt. < size="3"> Here's a shot of a garden I designed in Napa last fall (scroll down to October to learn about the others on this page), settling in for Winter, which for calendulas means 'showtime'. At 5:30AM the alarm went off, and I jumped out of bed excited for another trip to Digging Dog Nursery , way up in Albion, in Mendocino county. I picked up Michael Collins, of Mike's Urban Gardens, who introduced me to the nursery a couple years ago when he organized a gardeners' field trip that wonderfully morphed into a weekend right out of Sunset magazine. There is no comparing ordering through a catalog versus arriving at a nursery right after the gates open. Like all plant-crazy people, I like to get to places early for the best selecton. 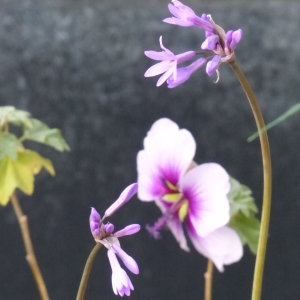 You may come home with a rarity such as the Lobelia tupaI bought last year. And there is no way to get to Digging Dog without passing some of the most beautiful countryside in North America. We pulled off 101 in Healdsburg for breakfast. Mike remembered an unpretentious diner in a mall just beyond the bougie part of downtown. We then cut through Anderson Valley via Rt. 128, and took a right at the Pacific Ocean. 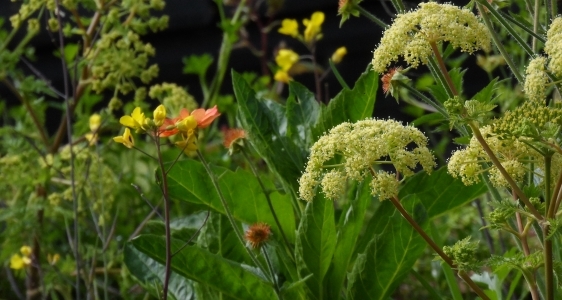 above: a warm toned, water-wise border brimming with Persicaria, Sedum, Eucomis, Origanum, and Epilobium to name a few. 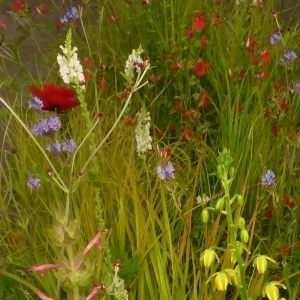 above, from left: a towering rarity, this drought tolerant Lobelia tupa originates from Chile. 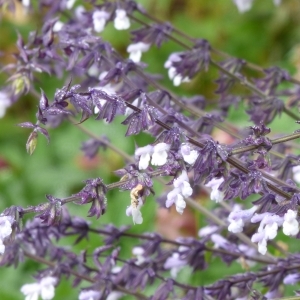 Highlights of bright near-white, here provided by a Salvia 'Waverly', add sparkle to Autumn beds. 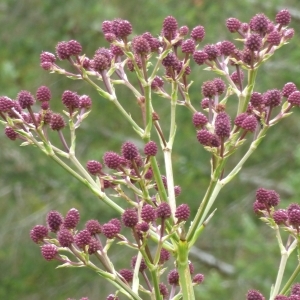 Another rarely seen skyscraper, Eryngium pandanifolium, launches a dramatic candelabra of garnets towards the clouds. Owner Deborah Whigam gave us a warm welcome; later we followed her on a tour of the nursery and demonstration garden, where she explained different design elements and the merits of various species. I purchased duplicates of successful selections I trialed earlier, and picked up a few new ones to try out ths year. above: beyond bloom- texture, structure, motion and sound carry a garden throughout the year, as seen in this border at Digging Dog. Ornamental grasses and the chartruese tentacles of Salvia 'Limelight' anchor this bed, while asters and ornamental oregano provide subtle tints of color. above: two October stars, Helianthus angustifolius on the left, and Muhlenbergia rigens to the right, Napa. This month, the pictures at the top and side of the page are from a project I began a year ago in Napa. Now that the wild explosion of annuals has literally gone to seed, it's easier to see some of the thought that goes into making a beautiful site. 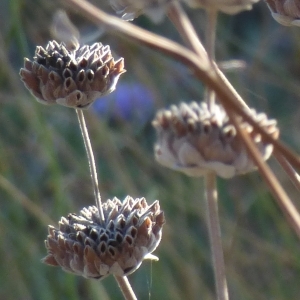 We've chopped and dropped most of the dead material, and left behind some decorative (and bird-feeding) seedheads. It's good to see the rocks again, and how they've filled in with Sedum, Erodium and Fescue (some areas took a beating in the 100+ heat), and recover the structure that the perennial shrubs have begun to create. The blooming crepe myrtle pleasantly surprised us, as did the quiet elegance of dried Linum, which you can see to the left looking like a bouquet of beads. The Garden Conservancy hosted British designer Arne Maynard, so a group of us gardeners headed out to the Presidio to hear him speak about the design process and discuss two of the gardens in his new book, The Gardens of Arne Maynard. He's currently featured in my favorite gardening magazine, Gardens Illustrated; this was a chance to bring the magazine to life. above, clockwise from top: Bay Area gardeners Michael Collins, Frank Eddy , Jeannine Zenti, and yours truly, outside the Disney Museum, San Francisco. Maynard is known for matching a garden to its location, using local references (and often materials) as well as his and his client's tastes. Gorgeous slides of the two gardens, one in the Hamptons, the other at Haddon Hall in Derbyshire, wonderfully captured the visions behind his process. At the reception we learned that twenty-five years ago he spent a year in San Francisco as part of 'finding himself'. The book is sumptuous. if you scroll down to June you'll see a 'before' picture of this new project out near Ocean Beach. At such an early stage this far away shot doesn't do it much justice, so here's some detail from an angle you'd see walking along the driveway. The big initial desire of the client was to keep the dogs from using the area as their personal toilet. I'll get into detail about how I dealt with that and other issues on the projects page. Seeing how we started this project in June, during the worst drought in history, I'm quite pleased with how it's turned out so far. On my way to a new sheet mulching project, I came across a fine example of beautility (beautiful + utility) on Cesar Chavez near the 101. Planted with five species native to California, this traffic island looks like it was rebuilt to absorb run-off, and I applaud its natural design. Imagine how less interesting this scene would be if someone had gone through and deadheaded the dark brown spikes of Salvia spathacea. You can find a similar palette used around the Divisadero corridor. Even on vacation I could not resist the urge to do some gardening; this is part of a micro border I installed at my mother's home. Next year the unmown spaces between the ornamentals will provide its own suite of naturally occuring flowers, including rudbeckia, solidago, carota and whatever the native asters are now called. I'll have more details on my projects page in the future. I was really excited to find this garden on the common of my home town during its bicentennial celebration. Liatris, echinacea, rudbeckia, hosta, phlox and hemerocallis turned up in nearly every garden in this part of the state, but their treatment here was impressive. Residents have access to a vast variety of day lillies, thanks to a nearby hobbyist (and what's more local than following hand painted signs to a dirt road?). My mother picked up a couple varieties earlier in the year from said site, and on the last week it was open, I got a great deal on a huge clump of some variety whose name escapes me. I also picked up some white liatris at a local farmstand. To you it may not look like much, but this is candy for a garden designer: a blank slate, a project you can see from the street, lots of traffic, plenty of sun, not to mention a very nice client. Oh, did I mention it's near the beach? Got most of the digging done last week, pretty soon, it'll be time to plant. Discoveries like this make me wonder if the local rodents have been munching too much brugmansia bark. 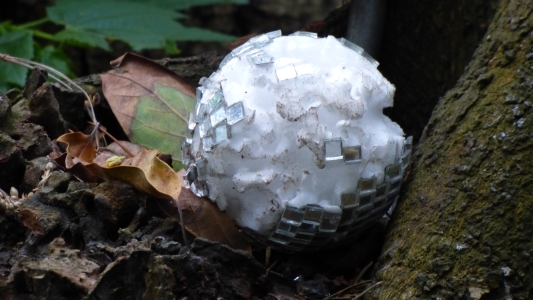 I'm assuming this is the work of a rat or squirrel that just couldn't resist a shiny, tiny disco ball, but what possessed it to continue after that first mouthful of styrofoam and glass? Some fun finds this week. 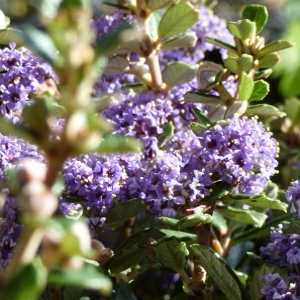 Yesterday was Strybing's first plant sale of the year, and I picked up some clarkias, as well as a new (to me) ceanothus for a customer. However, the week's most amazing find came from a supermarket. On way way home today I stopped at the Farmers Market in the Civic Center to see if I could snag anymore hellebores or other unexpected treasure. While not as dramatic as red hellebores, at less than three dollars each, the 1 gallon daylillies, tulbaghia and lavatera were still a deal. The first day of February felt more like the middle of May. As tempted as I was to go to the beach, I remembered I had already given into horticultural temptation last month and that it was time to be a responsible gardener. I continued the culling I'd begun last week (parsley and stinging nettles), and today removed all nasturtium volunteers, a few Senecio, pried out and potted up shoots of Acanthus 'Hollard's Gold', along with some invading Lamiastrum (these will be going to plant sales in the Spring). 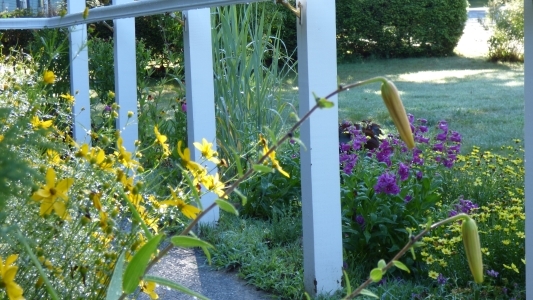 Did a major pruning and cleaning up of the Thumbergia that is attempting to occupy the whole yard, a big cut back of the Meso-American salvias, and pulled fading alstromeria stems, pruned an ancient zonal pelargonium, weeded pathways, and on and on. After all this work, it was time to reward myself. In January I made a few quick purchases for various reasons (see below), and now, having pried out a monsterous Albuca maxima , I had a bare spot waitng to be planted. This section became the Patch of Guilty Pleasures. There's a thrill in discovering 'finds' in unlikely places, that feeling of cleverness that you've uncovered something that others passed up, and it happened to me twice (so far) this week. 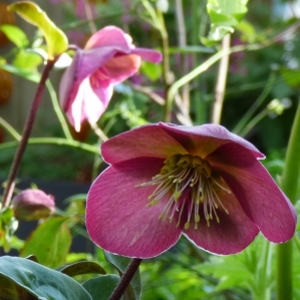 Hellebores are one of those plants that, despite their ease in care and propagation, are pricey, just like clivia and alstromeria. 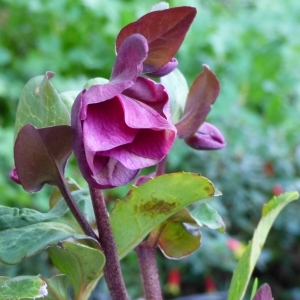 I had a dark flowered variety on my Annie's Wish List for quite a while, so imagine my surprise when I spied a wine colored hellebore in a 1 gallon pot at the Civic Center Farmers Market. "Three dollars, two for five", I grabbed the last pair. 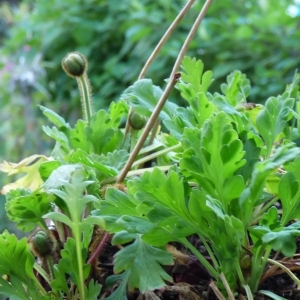 The other find is not so out of the ordinary species wise (yellow Icelandic poppies), but they'll fill a need perfectly. Any time I visit Flowercraft I check out their bargain basement section because I've stumbled upon some great plants there. 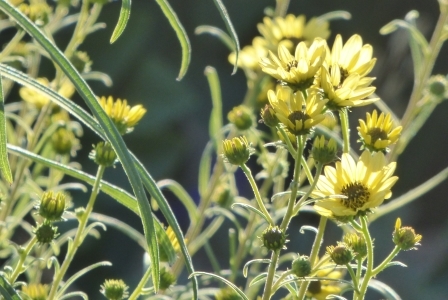 Last year my favorite was a six pack of a Chinese Mustard that had already bolted and was beginning to bloom, the butter yellow flowers against the merlot colored stems were great fillers last April (see if you can find them below). 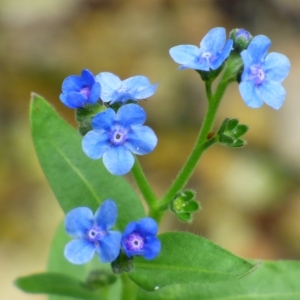 above left to right: Cynoglossum amibile, Ipheon sp. 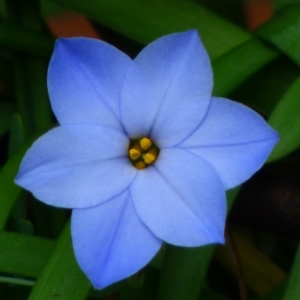 The surprise of coming across an unexpected blue flower takes my breath away everytime, sometimes more than once a day. Both plants are perfectly fine taking care of themselves and moving about the garden. 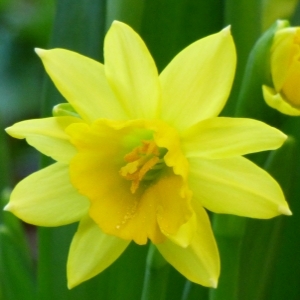 A common thread in customer remarks these last few weeks has been the confusion over flowers appearing out of season. If one subscribes to the idea that Nature will announce the End of the World with flora and fauna exhibiting bizarre behavior, one might be in the midst of serious handwringing. While not as dramatic as the sight of walrus hauled out onto beach for lack of ice, the out of synch blooms are literally in our back yards. 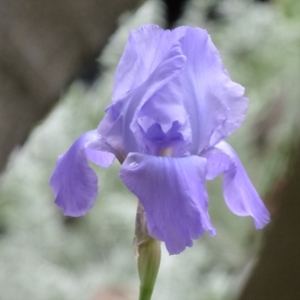 In my own garden, iris have been sporadically blooming since late September. I attributed this to dividing and replanting them to a new spot, but then one established plant decided to bloom in December. 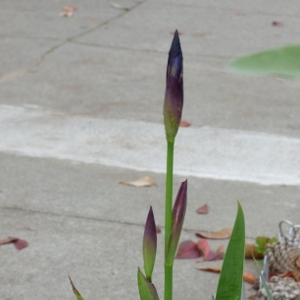 I have three spikes ready to burst open today, and a gorgeous white bearded iris is currently blooming in a barrel at the corner of Noe and 14th.